With two wins (well, technically one and a half) under my belt, as well as a hearty lunch from the historic KFC at Oxford Services which was once visited by King Charles on the way back from the Battle of Newbury (apparently he had a Zinger Tower burger, fries and a diet Sprite) the final game hove into view, with an anachronistically timed Early Italian Wars French army. Having seen this beastie earlier in the day (hey, there were only 6 players... it was hard to miss..) I knew already that it would have Kiels of maniacally gurning Swiss pikemen speeding across the table at a rate of knots, and god knows what else in a supporting role. The lists for the TYW German and Italian Wars French from this game, as well as all the other lists from the games at Oxford can be seen here in the FoG:R Wiki. The Early period armies are usually not a great match for the later ones in FoGR, making such out of period matchups problematic. However, the sheer resilience and hitting power of the deep Swiss formations usually means that they can frighten pretty much any range of armies in any competition. The challenge in using them succesfully is not so much one of winning the frontal combat, its more of keeping the rest of the army alive whilst the Swiss go round the table hoovering up targets one by one. With three games of terrain shuffling having now passed, the table was starting to look somewhat like a wargamers forehead - where once there had been dense vegetation, now there was acres of uninterrupted steppe-like space, entirely denuded of terrain. Heiliger Strohsack! The French had stacked their 2 Kiels of Swiss over to their right, and the German response was to fill that space with Horse in a sort of vague hope that it might be able to push forward and threaten the flanks (ha ha!) of the Kiels as they advanced, drawing them even further to the right and out of the way of the vulnerable German infantry - or even slowing their advance. But the Swiss had other, presumably well practiced and cannier moves in mind. Spinning on a Swiss Franc they turned and wheeled over to the extreme edge of the table to take aim square on against the German Cuirassiers. This left the German infantry centre somewhat in a new situation - they had expected to be sitting back and waiting to be hit like in the first game, praying for their artillery to do damage to the onrushing enemy horde - but now they had no real opposition. The French army had clouds of skirmishing infantry equipped with all manner of historic weaponry - arquebuses, crossbows and other C15th mechanical contraptions. Ich glaub mich knutscht ein Elch! The effect of this on the advancing textbook Pike and Shotte formations was negligible, but e'en so the Germans needed to be mindful of the possibility of a sub-par cohesion test result halting their stately advance. Donnerwetter! Southern Germany and the pre-BMW trade unionists of the Munchen Faction were intent on wheeling in line with the Tartuschiers - this keeping of a coherent line was keeping the enemt skirmishers honest and denying them any chance of gaps to exploit. The Swiss were now almost lined up along the edge of the table, square set to bear down on the German left flank. Autsch! As the Swiss formed up the German foote started to close in on their invulnerable flanks - German Horse had by now almost entirely exited the scene, leaving the almost immovable German artillery park naked and alone in the path of the onrushing slashed-sleeved hurricane. Soon, like a Catholic Papal magician pulling a tablecloth away from under a full set of religiously significant crockery, the rest of the German Cuirassiers squirted out of the danger zone. Mist! The French commanded their Swiss to wheel gracefully inwards to face off the German army on a new, much narrower frontage. Were they really looking to march to the far flank, and then roll up the entire 8' width (and now length) of the table without stopping to catch breath and insouchiantly discounting the possibility of any enemy action slowing their charge? The Gendarmes were inexperienced with such high tech weapons as small cannons and proper muskets - the fusiliade of fire from 2 full regiments of German foote slammed into the Gallic horsemen and unhorsed a full quarter of their number - crumbling their morale in the process. The French were now struggling to see a way to stop their baggage being looted. Genau! Yet more balls pinged into the French nobility, and yet more of them fell like autumn leaves to the battlefield surface as the Germans simply efficiently did their shooting business. The Swiss however were now ready. Admittedly their definition of "ready" appeared to be on in which pikes were apparently not compulsary equipment for any of the infantry, but possible traffic-related excuses aside the prospect of a decisive clash of empires and generations was now clearly laid out. The Germans had done as much as they felt that they could - setting up two units against one, and putting the Tartuschiers in a position in which they could at last get into that magical overlap position which they so craved. But what is this! The Tartuffelerists have a moment of pure incompetence, as faced with the possibility of perhaps actually being useful for the first time this whole weekend of campaigning they fluff their lines big-time! OK, they are a small unit, but taking shots from a couple of enemy crossbowmen should not be enough to cause them to panic and crumble like the crust of a West Country pasty on a long campaigning day in midsummer? Faced with such a disaster the Swiss and French have no hesitation in trying to rub salt into the newly opened wound of the apparent myth of German competence. Two kiels hit the German infantry and Horse, and, embarassingly, a formation of Light Infantry skirmishing arquebusiers attempt to rush the Tartuschiers as well. But, combat advantages are but naught to an army who clearly had been saving up their best dice rolls of the weekend for an opportunity to show off like this one - a perfect set of results gives the Swiss a bloody nose to match the blood-red-hued slashed sleeved of their exotic plunderhosen, and a base loss to boot. The Germans have not only survived, they have excelled and beaten the Swiss at their own hard-charging game! 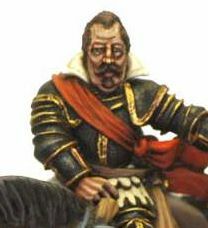 But everything that Superior German Cuirassiers and Pike and Shotte formations can do, apparently French Adventurier skirmishers can do also. The Tartuffererists break and run after an embarassing combat loss in the first round to the thinly ranked supposed shooting experts who find ways to poke their nasty little knives through the gaps in the Germans ornate and anachronistic armour to inflict a telling loss from which the German morale does not recover. They flee...Zum Teufel! But whilst the French shooters are having fun in hand to hand combat, the German dragoons are finding that their own shooting - admittedly supported by Pike and Shotte - is more than effective enough to blow away the French artillery park from distance. It is removed, leaving the way open for a rush to the French baggage train and saving both parties from the need to flick through the amended rules to see what happens if Dragoons capture enemy artillery as well - a huge relief for all concerned! The Swiss grind on over on the left of the German line. Here Teutonic cavalry in buff coats eschew the luxury of being crushed in successive rounds of painful melee and break off (yes - it does happen!) from the Swiss to try and find time to regain cohesion, but sadly not bases. This saves the Cuirassiers for a round or two, but does mean the artillery are at last left to their own fate. Deciding that this whole "run away for a bit and delay getting beaten for a while" malarkey is in fact the only sensible tactic to adopt against the Swiss machine, further units of German Cuirassiers do likewise. This does in fact buy them time, but also leaves the rather unfortunate Red Regiment of German infantry somewhat isolated - a rather harsh and cynical ploy to minimise losses and buy time on this side of the table whilst the rest of the German army mops up skirmishers and chases down baggage. The Red Regiment are giving this a real good go to be fair to them - the Swiss Kiel has been reduced to just 11 bases - or put another way, the entire German army has only managed to kill off 3 of them all game. Having beaten the Tartuschierallierists, a unit of French skirmishers get a proper good come-uppancing at the hands and pistols (careful...) of some proper full-fat, fully intact Cuirassiers. The luck of the French suddenly starts to run out in great fistfuls across the table. The French massed skirmisher tactic depends on an almost limitless table in which to continue to escape from the tender embrace of enemy forces, but the Germans ability to reach out and touch them gently with cannon balls and musketry is making that theory rather harder to put into practice. A wave of depression engulfs the French army as the Swiss realise that their opponents have finally worked out that the secret to beating them is in fact to try and hoover up all of the support units before the Swiss themselves chew up the majority of the oppoeing army on their own. This realisation hits them like a charging Lanschnect Kiel in their rear, and their morale falters marginally for a brief moment. Or, possibly they drop to DISR deliberately, in order to take advantage of the rule that Horse cannot break off from unstead foot, and thus their weight of Swiss numbers and superior Swiss factors get a few more turns to weak pain on the German Demi-cuirassiers? The Germans hang on grimly against the grinding machine-like Helvetic Confederation mercenary army, coughing up some superb death saving rolls to remain in the game for a turn or two longer than they really should do. Heroics by the men on the front line can decide many battles, and none more so than this one here today apparently. Dragoons finally do their textbook Dragoon-ey thing, and rush forward through an enclosed field to capture the French baggage. Dragooniers, raised on a diet of sausages and dumplings gaze on in wonderment and confusion at the spectacular array of culturally inappropriate baggage-carrying animals which feature in the Gallic train. Perhaps also if they look hard enough they may well find a large number of missing Swiss pikestaffs hiding under the hooves of the camels and bison? The German Horse clatter into the French mounted crossbowmen as the battle of the infantr continues. The excellente of 2 pistols compared to one crossbow is quickly demonstrated in a shattering attack, and then, with both Kiels still intact but the rest of the army driven to the 4 winds, the French sigh deeply and expire. The Result is a second decisive win for Germany! That was a staggering battle, in which I can now fully understand why my Austrian grandfather used to shake in fear and gibber like a baboon every time the cukoo-clock sounded the hour in the rural forest cottage he shared with what I now understand was my evil and sadistic grandmother from the town of Zurich. It was hard enough coming up with a plan to stop the Swedes, but next to them the Swiss were like a force of nature compared to a small clockwork toy. They move fast, fight like demons and refuse to die - even the addition of a General makes them stronger, and more ludicrous - at one stage they I swear were re-rolling 1, 2 and 3's in a combat where only 3 or more was needed to record a hit! The skill of the game is not to get fixated on these impossible opponents, but instead to concentrate on what can be onw - and this I did admirably, catching baggage and artillery and sweeping up the light foot with efficiency which my homeland would be most proud of. With three wins out of three I confidently predict a podium finish, and a great end to a great outing for a great set of rules in the shape of FoGR. Lets play again soon! The good fortune came in that your cowardice and lack of a proper plan forced you, totally accidentally, into the proper direction of simply running from the Swiss. The shambles was however that it then took you night on half the game to realise that chasing down the enemy light foot was the way the game would be won - and that needed plenty of your cavalry to redeply all across the table to achieve. But, anyway, the spoils go to the ones who get their figures on table the most, and you certainly did get the 28mm troops out and about here in decent numbers, and that at least I enjoyed. Roll on future opportunities to mix things up a little is what I say.